Your FRITZ!Box establishes a connection to your LTE provider as soon as you insert your SIM card and enter the PIN in the FRITZ!Box user interface. This can take up to 2 minutes. During this time, the "Power" LED on the FRITZ!Box flashes and then stays lit as soon as the connection has been established. The FRITZ!Box supports LTE networks in the 800 MHz and 2.6 GHz frequency bands. The FRITZ!Box does not support other frequency bands. Note:The FRITZ!Box does not support the 1.8 GHz frequency band used by some providers in some areas, for example. Refer to your LTE provider for information on the frequency band used in your local area. Check whether it is the mini-SIM (25 x 15 x 0.76 mm) SIM card you received from your LTE provider and that the contacts are not damaged. Important:You cannot use micro or nano SIM cards that have already been punched out and inserted into a SIM card holder or SIM cards intended for mobile connections according to the mobile standard UMTS/HSPA (3G). SIM card holders can get jammed and damage the SIM slot. If it is not the mini-SIM card you received from your LTE provider or the contacts are damaged, contact your LTE provider. 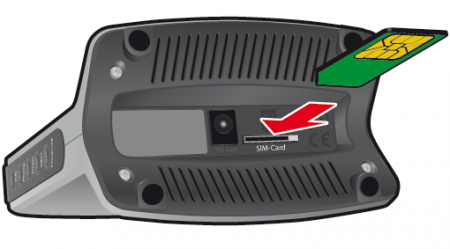 Pick up the FRITZ!Box so that you are facing the underside of the device and can read the "SIM Card" label on the SIM card slot. Have your LTE provider activate the SIM card for use with the LTE network. Enable the option "Permit roaming". If the option is not displayed, enable the Advanced View first. Now the FRITZ!Box shows the signal strength of both LTE antennas. Select a location for the FRITZ!Box where the value displayed is as high as possible. Position the FRITZ!Box as close to an outside wall as possible. If you know where your provider's LTE radio cell is located, position the FRITZ!Box by the wall facing the LTE radio cell. If you are using the FRITZ!Box in an area located on the edge of the LTE radio coverage area (outdoor coverage area) of your LTE provider, then the internal LTE antennas may not be sufficient for an LTE connection. Therefore, the FRITZ!Box cannot resolve this issue. Note:Some FRITZ!Box models allow you to connect an outdoor antenna (for balcony or roof, for example). These models are suitable for use in outdoor coverage areas. Refer to our sales team for information on these models. Your LTE provider can tell you whether you are using the FRITZ!Box in their indoor or outdoor coverage area.